The risk directly associates with low levels of vitamin D. That is the conclusion of recent study published in the European Journal of Cancer. The investigators measured the blood vitamin D levels of 137 subjects who had been diagnosed with melanoma. They collected the blood samples at the time of diagnosis of the disease. Another group of 99 healthy subjects served as the control group. The investigators collected the samples of the control group between October and April. The scientists then compared the blood collections of the melanoma group with those of the control group. They then determined whether vitamin D levels had an association with melanoma risk. The study produced convincing results regarding vitamin D and melanoma risk. The controls (no melanoma) had vitamin D levels 50% higher than the melanoma group (27.8 ng/ml vs. 18 ng/ml). 66.2% of the melanoma group had vitamin D “deficiency,” compared to only 15.2% of the health controls. The scientists defined vitamin D deficiency as being equal to or less than 20 ng/ml. So, the melanoma group had more than four-times the risk of deficiency. The scientists defined vitamin D “sufficiency” as being equal to or greater than 30 ng/ml. 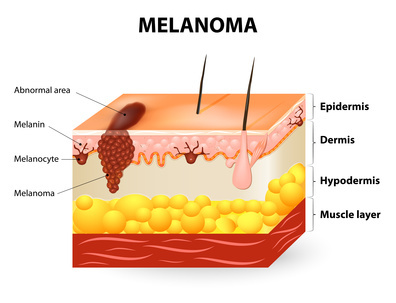 They found that only 7.4% of melanoma patients were sufficient, compared to 37.4% of healthy controls. Hence, the melanoma group had about one-fifth the likelihood of having sufficient D levels. First of all, the science demonstrated a significant inverse association with vitamin D sufficiency versus deficiency. Those who had sufficient levels had only 4% of the melanoma risk when compared to those who were deficient! Hence, this demonstrates that those with the lowest vitamin D levels (after adjusting for confounding factors) had 25-times the melanoma risk! And, vitamin D insufficiency vs. deficiency was significantly inversely associated with melanoma. Those who were insufficient had a definite advantage over those who were deficient. They had only 13% of the melanoma risk. In addition, this research proves conclusively that sun deprivation is a major cause of melanoma. I say this because about 90% of serum vitamin D is produced by sun exposure to the skin. So, the aforementioned research is really research on sun exposure. It shows that regular sun exposure leads to a profound reduction in melanoma risk. Therefore, Vitamin D levels are surrogate measurements for sun exposure in nearly every case. Could sunlight increase health through photoproducts beyond vitamin D? In conclusion: My new book, Embrace the Sun (coauthored by Dr. William Grant), notes that sun exposure provides more than vitamin D. It also provides other photoproducts such as nitric oxide, serotonin, endorphin, and brain-derived neurotropic factor (BDNF). All of these photoproducts are vital to human health. Could these photoproducts have a positive and protective effect against melanoma risk beyond vitamin D? And, vitamin D produced by sunlight may be superior to that given in pill form. Finally, this research gives us one more reason to embrace the sun safely without burning. And who would have thought that safe sunlight could be one of the best prophylactics against melanoma risk? Sun Exposure is more important than Vitamin D to stop Cancer Development.